Jakarta - After its introduction in March 2017, finally PT Yamaha Indonesia Motor Mfg. (YIMM) officially handed dozens of scooters bumpsor TMAX DX into the hands of Indonesian consumers. The event titled #TMAXFirstOwner was held at Yamaha Flagship Shop Cempaka Putih, Jakarta. "We appreciate #TMmaxDXFirstOwner for their belief in Yamaha premium products.This is the highest class of MAXI Yamaha which is the dream of every rider.Do not be afraid, we are committed to maintaining the quality of our services especially for CBU consumers," said Deputy GM Marketing YIMM, Eddy Ang, Saturday (24/3/2018), at Cempaka Putih Jakarta. For the record Yamaha TMAX DX is currently priced at Rp 299,900,000 (on the road). "I hope you always use it in good condition and can feel comfortable while driving it.In addition, the best features are also given Yamaha TMAX," added Eddy. Agus Dimas Saputra as technical Education Yamaha tells the various advantages offered Yamaha TMAX DX. "The main feature is very complete compared to previous generations, such as Yamaha D-mode, the riders can have 'Mode T', when it wants to drive in the city.For the 'Mode S' will perform well when consumers need the best performance, "said Dimas in explaining the best features to consumers Yamaha TMAX DX. 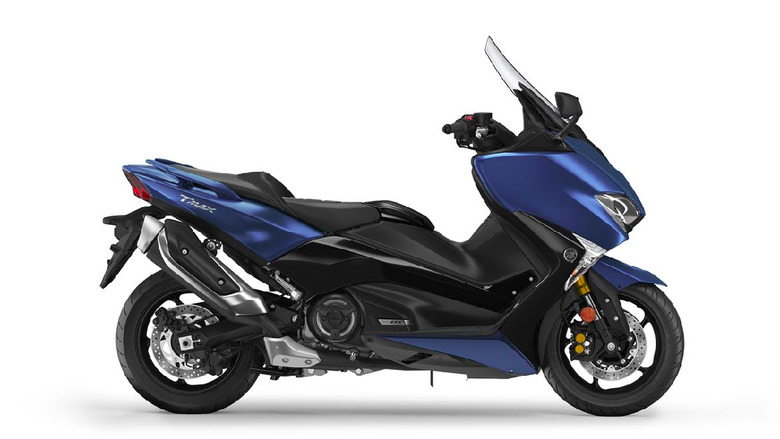 "The Yamaha TMAX DX is also equipped with Cruise Control, which is very useful when the customers are turing or when traveling long distances.This feature makes the motor can drive without using a trip gas.When the motor 50 km / h that it can directly use it," added Dimas. Dimas also explains the mainstay feature of Yamaha TMAX DX is E-adjustable windscreen, this windscreen has the size setandar reach 1,420 mm and 1,555 mm for the highest position. "Traction control features, this feature can avoid rear tires to slip, and this feature can be turned off or turned on.And that is not less important, TMAX DX has a warranty of 3 years or 35,000 km, In addition, for 3 years also consumer grastic service replacement of spark plugs, oil filters and air filters.Customers of TMAX DX can also enjoy Emergency Service, Home Service, and personal service, "said Dimas. Yamaha TMAX DX offers 530 cc engine, two-cylinder inline DOHC four valves with fuel injection discharge system. This machine is promised will be able to spray 45 horsepower in RPM 6.750 and has a torque of 53 Nm at 5250 RPM. 0 Response to "Yamaha TMAX Scooter Rp 299.9 Million Started Sent to the Hand of Consumers"